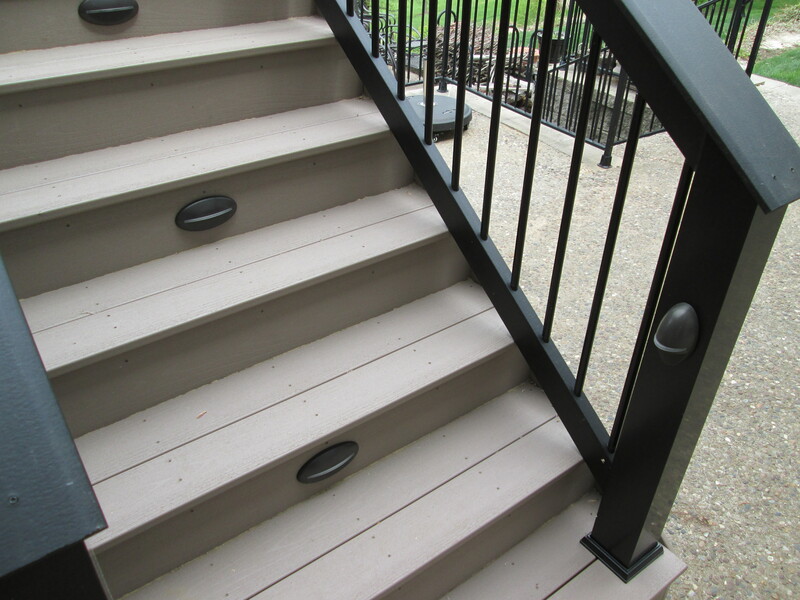 Deck step lights are rather unobtrusive but will prevent trips and falls. Built-in lights are installed on the riser portion of the step and shine doward to illuminate each step. Deck post lights are sometimes called ‘down lights’ or accent lights because they’re installed directly on the railing posts and shine downward. 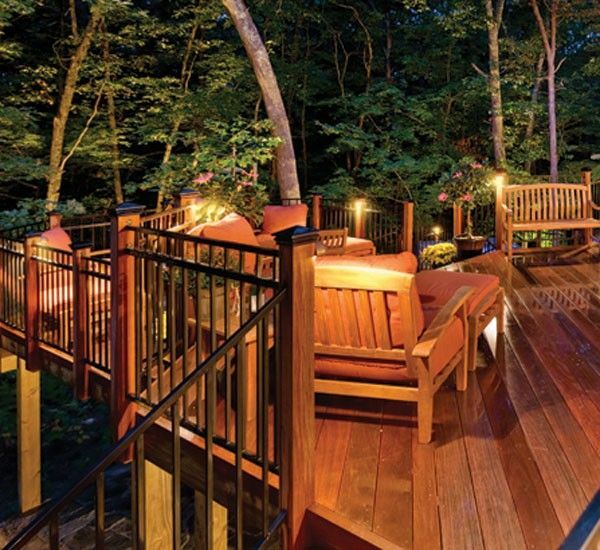 These fixtures offer general illumination for the entire deck and highlight sitting areas as well as traffic paths. 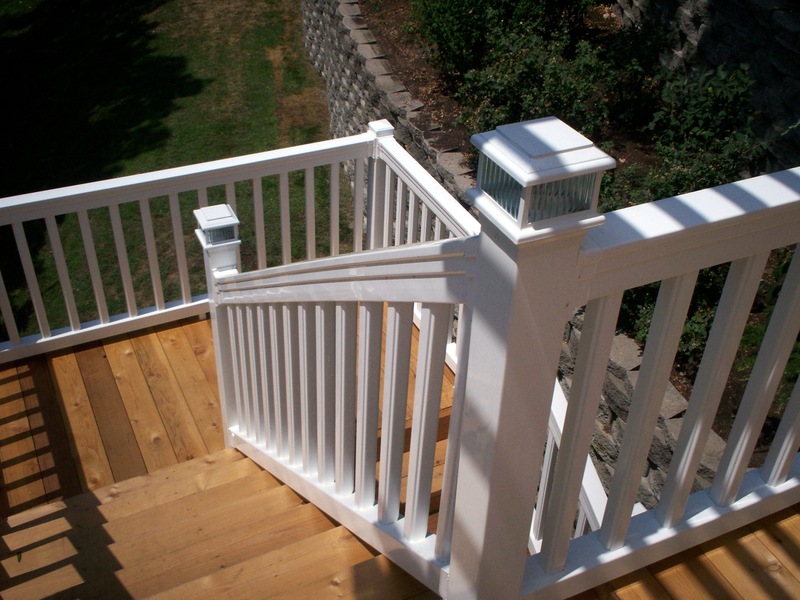 Deck cap lights are located on the top of the railing posts. And there are two types. The first style is built into the cap itself and isn’t very noticeable unless illuminated. The second option sits directly on top of the cap and provides a decorative component too. Rope or strip lighting is visually unique and is often installed to outline specific deck features such as a bench or rail. Two other types of lighting worth mentioning include general flood lights and string lights. For security and safety, we recommend at least one flood light that points outward toward the yard. And if you prefer a DIY project, consider string lights instead of built-ins. These can be purchased from Ikea, Target and many other retailers. So don’t put away the lounge chairs or grill just yet! Use lighting to highlight the best features of your outdoor space while illuminating walkways and steps to avoid trips or falls. This way, you can enjoy your backyard in the evening and throughout the seasons. If you live in the Greater St. Louis Missouri region and you’d like to talk with a local deck builder, please reach out to us, Archadeck of West County and St. Charles County. Our phone number is 636.227.0800 and our website address is west-county.archadeck.com. We’re locally owned and operated with decades of experience. Read more at About Us here on the blog. But if you’d still like to explore and discover ideas for decks, screened porches, pergolas, gazebos and more, you might find our new Pinterest page a great resource for everything ‘outdoor living. Find Archadeck on Pinterest at http://www.pinterest.com/archadeckstl/.